Does not tear. Can be used without interrupting play. Aeration of the roots, greatly stimulating a healthy and vigorous growth and preventing burning during hot weather. The holes made by the spikes permit the hot air to escape and the fresh, stimulating air and dew to penetrate the roots, at the same time loosening the soil, allowing the roots to spread freely and healthily and providing drainage. Allows top dressing to penetrate easily to the roots ensuring quicker and more lasting results. Cross section showing shape of incision made by spikes. This portable tool is the ideal aerator for smaller lawns, smaller areas of turf and where access is narrow. A comfortable and easy tool to use. 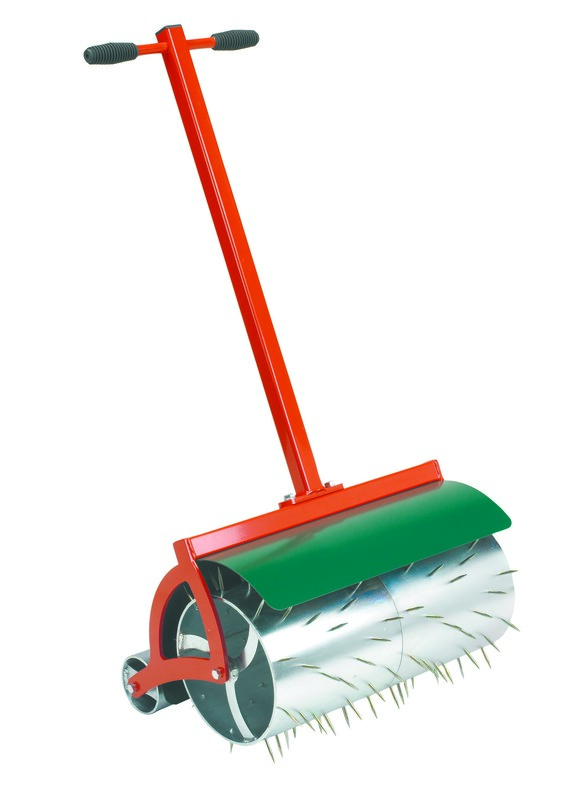 For use on golf greens, bowling greens, tennis courts, croquet lawns and larger gardens. Weight 54 kgs 126 spikes. For speedy aeration of larger Greens, Bowls, Cricket Squares, Tennis Courts etc. Fits All Sarel spikers and attachments to tactors.